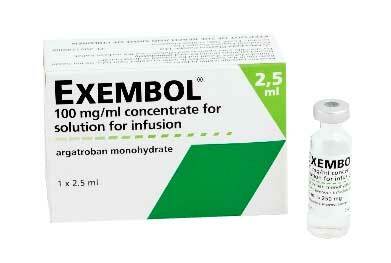 Exembol (argatroban) is now available in the UK for the treatment of thrombotic disorders in patients with heparin-induced thrombocytopenia. Exembol Summary of Product Characteristics, May 2011. Lewis BE et al. Circulation 2001; 103:1838–43. Lewis BE et al. Arch Intern Med 2003; 163:1849–56.